An algorithm to monitor the joints of patients with arthritis, which could change the way that the severity of the condition is assessed. The technique, which detects tiny changes in arthritic joints, could enable greater understanding of how osteoarthritis develops and allow the effectiveness of new treatments to be assessed more accurately, without the need for invasive tissue sampling. Osteoarthritis is the most common form of arthritis in the UK. It develops when the articular cartilage that coats the ends of bones and allows them to glide smoothly over each other at joints, is worn down, resulting in painful, immobile joints. Currently, there is no recognised cure and the only definitive treatment is surgery for artificial joint replacement. The technique developed by Dr Turmezei and his colleagues uses images from a standard computerised tomography (CT) scan, which isn’t normally used to monitor joints but produces detailed images in three dimensions. The semi-automated technique, called joint space mapping (JSM), analyses the CT images to identify changes in the space between the bones of the joint in question, a recognised surrogate marker for osteoarthritis. 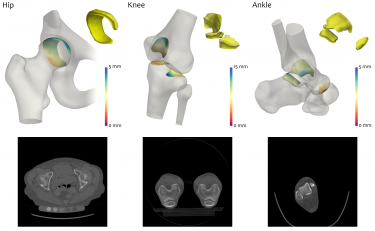 After developing the algorithm with tests on human hip joints from bodies that had been donated for medical research, they found that it exceeded the current ‘gold standard’ of joint imaging with x-rays in terms of sensitivity, showing that it was at least twice as good at detecting small structural changes. Colour-coded images produced using the JSM algorithm illustrate the parts of the joint where the space between bones is wider or narrower. The results are published in the journal Scientific Reports. This entry was posted in Clinical Development, Clinical Research, Digital Development, Osteology, R&D, Rheumatology on June 21, 2018 by admin. The drug denosumab was superior to a commonly used drug in a 12-month study enrolling 795 patients. About one in every 100 people in the world takes glucocorticoids long term to treat immune-mediated diseases. However, glucocorticoids, such as prednisone, have a side effect — they induce the bone loss called osteoporosis, causing an estimated yearly bone fracture rate of 5 percent. An alternative treatment option now appears promising. The study was headed by Dr Kenneth Saag,the Jane Knight Lowe Professor of Medicine at the University of Alabama at Birmingham. Dr Saag and colleagues compared the monoclonal antibody denosumab against a standard treatment for glucocorticoid-induced secondary osteoporosis, the bisphosphonate risedronate. In the 12-month results of their 24-month study, they have found that denosumab was superior to risedronate, as measured by increased bone density in the lower spine. The double-blind study enrolled 795 patients at 79 health care centres in Europe, Latin America, Asia and North America. Of these, 505 were glucocorticoid-continuing patients who had received glucocorticoids for at least three months, and 290 were glucocorticoid-initiating patients who had received glucocorticoids for less than three months. Patients were randomly assigned to one of two groups. The denosumab group got a shot of denosumab underneath the skin every six months and took a placebo pill every day. The risedronate group got a placebo shot every six months and took oral risedronate every day. Besides the superior lumbar spine bone density with denosumab after 12 months, researchers also found that denosumab was superior to risedronate for bone density measured in the total hip and at the neck of the femur, the large bone of the thigh. The two treatment groups had similar safety profiles. The researchers note that the study compared denosumab with risedronate, so the relative performance of denosumab compared with osteoporosis treatments besides risedronate has not yet been established. The study has been published in the journal The Lancet Diabetes & Endocrinology. This entry was posted in Clinical Trials, Endocrinology, Immunology, Osteology on May 3, 2018 by admin.